While moving a bookcase to paint the living room, I discovered two catalogs and a list of good roses for our area on one of the shelves. The catalogs were from Rose of Yesterday and Today, located on Browns Valley Road in Corralitos. The nursery has gone through many changes since I started my garden and is now only a shadow of its former self but still operating. 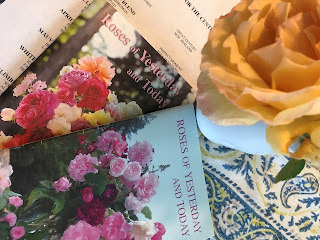 The catalog, however, was fun to go through and remember all the roses I bought from this specialized nursery which offers old garden roses and unique or hugely popular modern roses. By running my finger down the list of entries, I kept recalling the ones I bought. I'd completely forgotten that I once grew several rugosa roses. They are essentially hedge roses and have the desirable quality of sending out runners which quickly fill in the empty spaces and create a living fence. Unfortunately, in a standard backyard garden where most roses are grown on rootstock, a rugosa on its own roots will send out runners all over the bed. Rugosas also aren't roses which keep their petals very long and aren't good for cutting or show. They do offer healthy plants, interesting hips, and most complimentary, unusual fragrances. I kept Frau Dagmar Hastrop in the back garden for a decade or so because her flowers had a wonderful clove fragrances so different from most other roses. Visitors loved smelling them. I also found a list containing roses the Monterey Bay Rose Society recommended as easy to grow. It was an old list and many varieties have been replaced by ones now more readily available. On that list, I'd remembered several that were once in my garden. Why aren't they still in the yard? Good question and the answers are many. I'd moved some bushes around several times adjusting roses for the heights they attained. Many didn't like waiting for a new spot in a pot and died. Others mildewed or proved to be riddled with rose mosaic virus which I pledged to remove from my yard. Still others were good roses but didn't flower enough to justify the amount of space they were taking up. Many roses wanted more heat than Salinas provides and I gave them away. So now, when Joe Truskot says he's grown 250 different varieties, he's lying. The count is 258 and growing.